As a student working at KOLD-TV, alumna Stephanie Soto helped create the first Southern Arizona app for Spanish-speaking news consumers. Graduate student Bakina Wellars from Rwanda participates in News Hack Arizona, learning data journalism and coding skills with members of the Arizona Daily Star. Student Victor Garcia asks Washington Post reporter Dana Priest a question at the 2016 Zenger Award dinner. Seated at the table is Frank Sotomayor, chairman of the school's Journalism Advisory Council who helped the L.A. Times win a 1984 Pulitzer for its series on Latino issues. 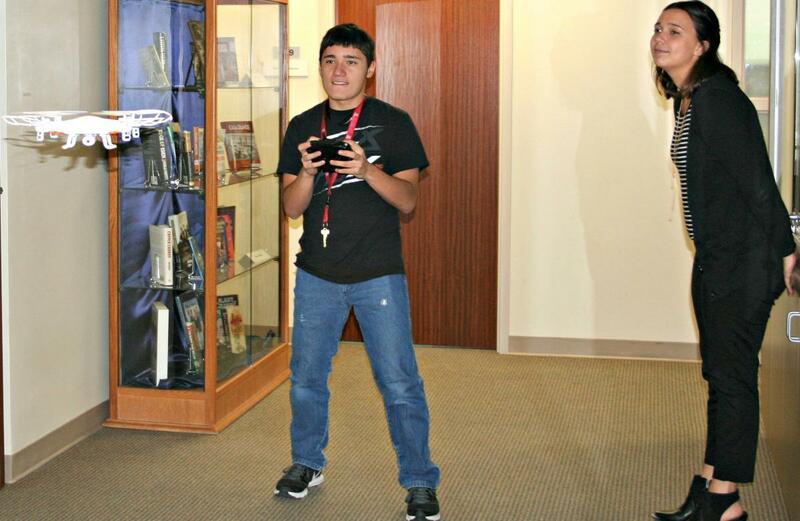 High school diversity workshop student Thomas Lard (Salome HS) flies a drone with help from UA journalism student Christianna Silva. Recent grads (from left) Kristina Bui, Brittny Mejia, Stephen Ceasar and Marisa Gerber helped the L.A. Times win a 2016 Pulitzer Prize for breaking news for their reporting and editing contributions to the San Bernardino mass shooting. The School of Journalism faculty members and staff believe diversity and inclusion are essential to bettering journalism and society. The media industry does not accurately reflect the people it serves – only about 13 percent of journalists are racial minorities (compared to nearly a third of the U.S. population), and men still dominate newsrooms even though two-thirds of journalism grads are women. Diverse views are critical in journalism. To that end, the school is committed to proactively fostering diversity and inclusion throughout its curriculum, hiring, and day-to-day practices. • In the classroom. Each year faculty members compile and review their efforts to promote diversity throughout classes and throughout the program. See the latest 2018 diversity report for the 2017-18 school year. • Systematic improvement. The school’s Diversity and Inclusivity Plan outlines what the school is doing to foster diversity and inclusion in the program. • Outside of class. School clubs enhance the student experience, including student chapters of the National Association of Hispanic Journalists, Native American Journalists Association, National Association of Black Journalists, and Asian American Journalists Association. • Communications. School diversity coordinator Maggy Zanger leads the school diversity listserv and school diversity Facebook page. She can be reached at zanger@email.arizona.edu. • Listening to students. The school surveyed students in October 2016 to assess the climate of diversity and found that most students believe the school supports diverse students, but that the faculty could be more diverse. The school also held a “listening tour” on Dec. 2, 2016, to gather insights and perceptions from students about their experiences in and outside of class. • Looking at ourselves. An assessment of the school’s diversity efforts is provided in our national accreditation self-study. See the last 2011-12 re-accreditation report for the school’s progress on diversity and inclusion. The school will be up for national re-accreditation in 2017-18. • Mentoring youth. For more than 35 years, the school has hosted a high school summer workshop for diverse high school students to inspire them to consider careers in journalism. Many of the students then came to the UA, graduated, and are now working journalists. • Recruiting diverse faculty. The school started a faculty visiting diversity fellow program – hosting a promising scholar who would be a good fit for the school to speak about issues important to disadvantaged populations. We feel we must be proactive to recruit the best and most diverse faculty to represent the students we serve. The first visiting scholar was Jessica Retis of Cal State Northridge in February 2017. • Safe Zones. Many faculty members, including the school director, have undergone Safe Zone training to support LGBTQ-plus students. Look for the Safe Zone sign. • Internships: Students can contact Internship Coordinator Renée Schafer Horton for internships that might include diversity opportunities. • Here to listen. If anyone feels discriminated against, they are encouraged to contact School Director Carol Schwalbe or campus resources such as the Dean of Students (student-on-student discrimination) or the Office of Institutional Equity (allegations of discrimination by faculty or staff). Don’t be silent.